California Tortilla is always looking for ways to incorporate fresh, nutrient-packed ingredients into its reimagined Mexican menu. Warm days, cool sea breezes, leisurely lunches with only the freshest, locally-grown ingredients—we could all take a page from the Mediterranean way of life. This May, California Tortilla is doing just that, bringing the flavors of the Mediterranean stateside with the Mediterranean Bowl, a refreshing new menu option that’s available starting today, for a limited time only. The Mediterranean Bowl features customer’s choice of grilled mesquite chicken or farm-fresh veggies, on a bed of romaine lettuce, pearl couscous, Israeli salad (tomato and cucumber) and hummus. It’s topped off with tzatziki, fresh sliced avocado, feta cheese and California Tortilla’s signature California Screamin’ sauce and finished with a tortilla crisp. 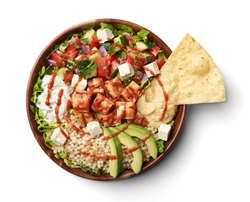 Putting a fresh spin on traditional Mediterranean flavors, the fast casual restaurant adds a Mexican twist: the Israeli salad is made with lime juice and cilantro; and California Screamin’ is a spicy, smoky chipotle sauce available only at California Tortilla locations. The cost will be $8.39 or $8.59 (depending on store location). The Mediterranean Bowl will be available through the middle of August. Fast Casual leader California Tortilla serves fresh, made-to-order, delicious, award-winning signature burritos, quesadillas, and salads all grounded in a foundation of Mexican cuisine yet combined with imaginative flavor combinations and customization opportunities. They are Mexican Re-Imagined. Based in Rockville, MD, the fast-casual chain has nearly 50 locations across the East Coast in Maryland, Virginia, West Virginia, Pennsylvania, Delaware, New Jersey, Florida and the District of Columbia. They are best known for their fresh food, unique recipes, innovative promotions, customer and community engagement via Twitter and Facebook. For more information and to inquire about franchising opportunities, please visit http://www.californiatortilla.com or call 301-545-0035.